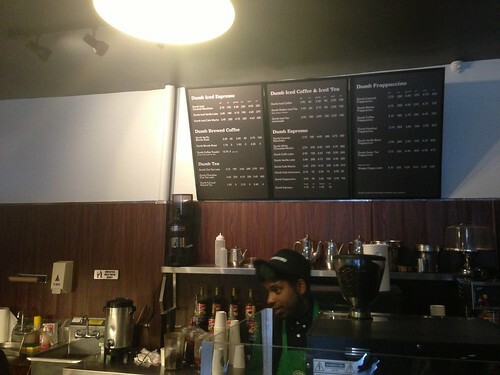 Franklin Avenue: A Visit to "Dumb Starbucks": Parody? Art? Silliness? 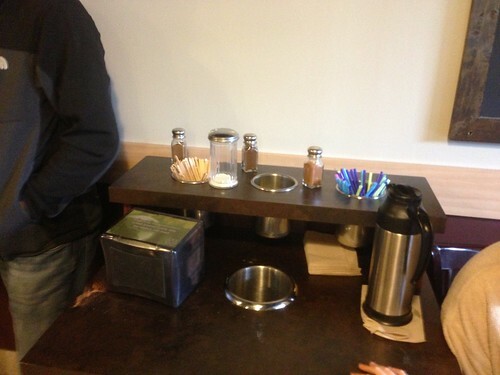 Or Is Starbucks In on the Ruse? 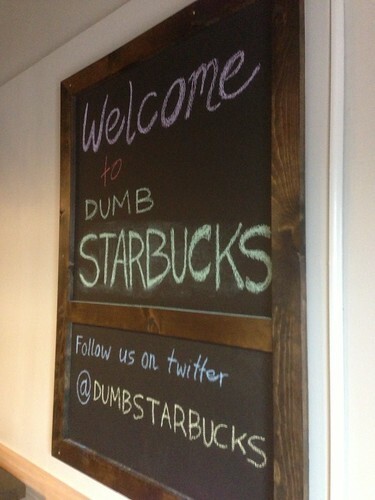 A Visit to "Dumb Starbucks": Parody? Art? Silliness? 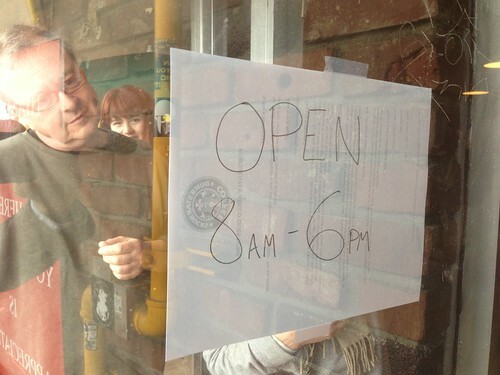 Or Is Starbucks In on the Ruse? 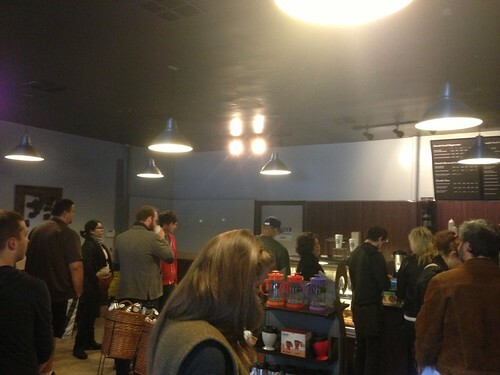 Behold, the power of social media: A day after folks like Rainn Wilson and Dan Harmon tweeted out photos of the mysterious new Los Feliz coffee shop "Dumb Starbucks," the place was mobbed with people on Sunday morning. 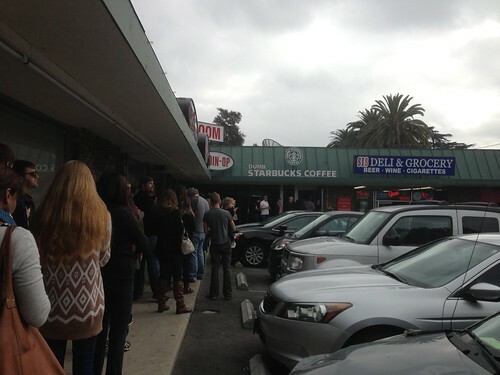 A line snaked down the length of the Hillhurst strip mall, and even a camera crew from KABC/7 was there. 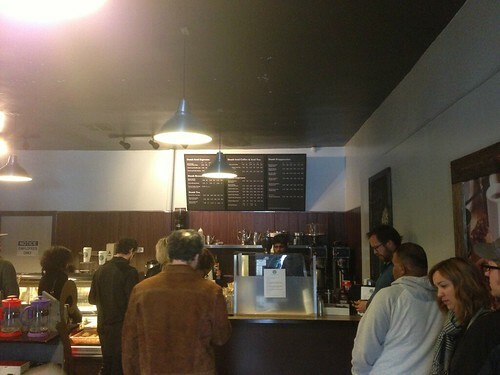 I didn't have an hour to wait in line just for a free cup of coffee, but I did poke around and take a ton of photos. It's real, and not just a photoshop joke (which was my first inkling yesterday). 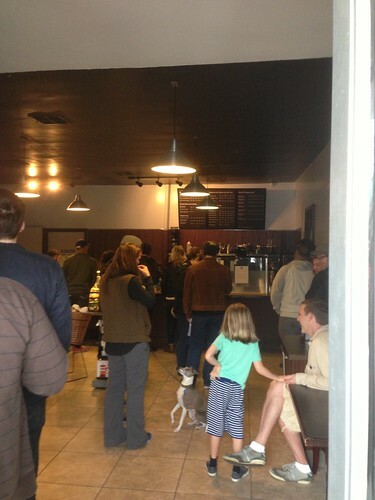 Somehow, this faux Starbucks was erected with few noticing until yesterday. 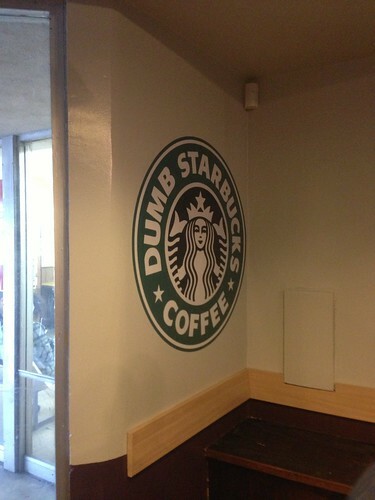 Although we are a fully functioning coffee shop, for legal reasons Dumb Starbucks needs to be categorized as a work of parody art. 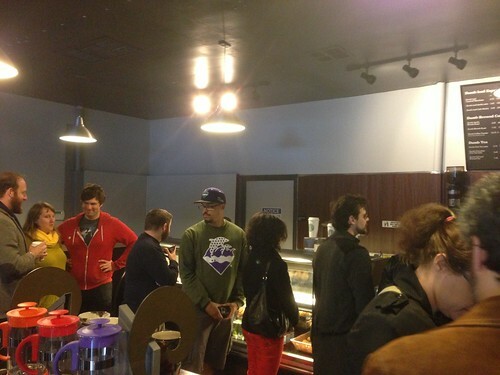 So, in the eyes of the law, our "coffee shop" is actually an art gallery and the "coffee" you're buying is considered the art. But that's for our lawyers to worry about." What this means is courts go through four steps, the first of which is to look at whether the creator of the new work did it as social commentary or financial gain. Next, they look at whether it is parody, satire, criticism and if that purpose is obvious in the content. A judge will also consider how much of the original work is included, and whether the will hurt the present or future sales of the old work. 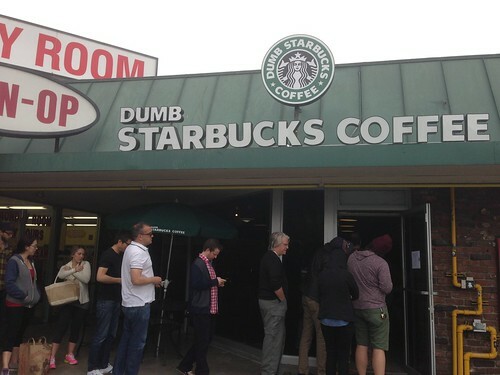 Does "Dumb Starbucks" pass this test? Seems doubtful. The "Dumb Starbucks" FAQ compares their "fair use" to Weird Al Yankovic's parodies. But "Weird Al" always requests permission before recording a parody -- and doesn't release parodies if he doesn't get the original artist's green light. (Prince famously declined, for example.) But hey, I'll enjoy the sheer weirdness of this exercise while I can. ADD: Commenter Justin Levine notes that we shouldn't be looking at copyright law, as this would be a trademark case: "It's actually not a question of copyright, but rather, trademark. So the '4 factor fair use test' from copyright doesn't come into use here. There is a parody defense in trademark law (just as there is in copyright). But courts have been very inconsistent in applying it or articulating why one parody should survive while another should be struck down. (Just as they are often inconsistent with fair use in copyright cases.) 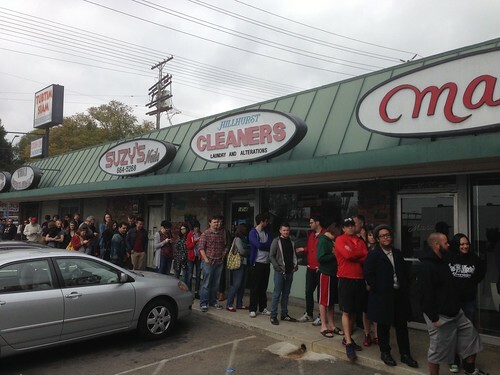 These cases are never clear cut from a legal standpoint. While it may be a best seller, is it really parody? If so, it’s protected as free speech. If not, it’s trading on Starbucks’ goodwill. In the Ninth Circuit, “a true parody will be so obvious that a clear distinction is preserved between the source of the target and the source of the parody….” Dr. Seuss Enterprises, L.P. v. Penguin Books USA, Inc., 109 F.3d 1394, 1405 (9th Cir. 1997). Moreover, “[t]he claim of parody is no defense ‘where the purpose of the similarity is to capitalize on a famous mark’s popularity for the defendant’s own commercial use.’” Id. at 1406, quoting Hard Rock Cafe Licensing Corp. v. Pacific Graphics, Inc., 776 F.Supp. 1454, 1462 (W.D.Wash.1991). As the Ninth Circuit later explained, “the book The Cat NOT in the Hat! borrowed Dr. Seuss’s trademarks and lyrics to get attention rather than to mock The Cat in the Hat! The defendant’s use of the Dr. Seuss trademarks and copyrighted works had no critical bearing on the substance or style of The Cat in the Hat!, and therefore could not claim First Amendment protection. Dr. Seuss recognized that, where an artistic work targets the original and does not merely borrow another’s property to get attention, First Amendment interests weigh more heavily in the balance.” Mattel, Inc. v. MCA Records, Inc., 296 F.3d 894, 901 (9th Cir. 2002). 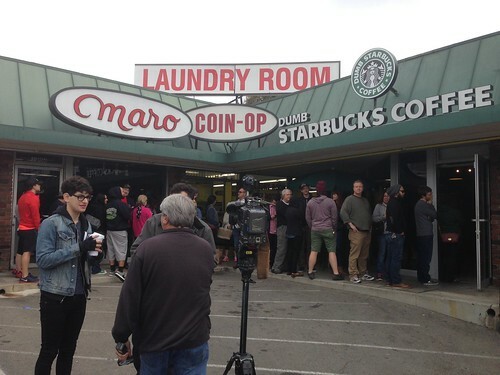 Given these authorities, Kerusso’s use of Starbucks’ mark appears mainly to get attention. 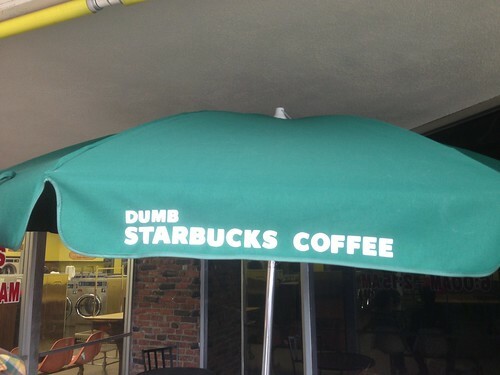 It does not mock Starbucks or offer any comment on the company the mark represents; it merely makes use of the company’s familar trademark. Therefore, it probably is infringing (and dilutive) use. Weird Al is under no obligation to ask permission from the artists he parodies; he's simply doing it as a good-natured courtesy (he doesn't want bad press and the artists themselves are usually flattered and help promote his parody songs).